When you want a tough daily use knife for tasks and chores that performs like the military tactical M16 models made by designer Kit Carson, you choose Columbia River's CRKT M16-01S Spear Point Folding Knife. Columbia River crafts the blade of this folder out of 8Cr13MoV steel, which is then polished with a bead blast finish. 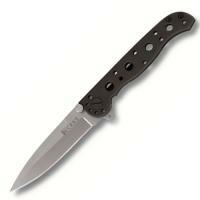 The CRKT M16-01S features a spear point style blade and a plain cutting edge. The folding knife includes a black handle made out of stainless steel, a frame lock mechanism, and the signature Carson flipper for easy opening.